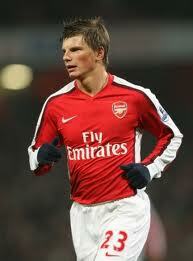 football-focus-news: ARSHAVIN TO LEAVE ARSENAL? Andrey Arshavin has been offered an escape route out of Arsenal — by his old side Zenit St Petersburg.The Russian's form for the Gunners has been patchy this season, with reports suggesting he has become unsettled in London.Arshavin has scored just four goals in 22 Premier League appearances this term and faces stiff competition for a starting place from Theo Walcott. And now Zenit sporting director Igor Komeev claims he is keen to re-sign the 29-year-old, who moved to the Emirates in a £15million switch two years ago. He said: 'With Arshavin it is very simple — we would always welcome him back to the club whether that is now or in the future. "However, Arsenal boss Arsene Wenger insists he has no intention of letting Arshavin quit the Londoners.Wenger said: "He will not leave, I'm very happy with Arshavin. As far as I know, he and his wife are happy in London. I'm really happy with him. "He is a great player. He is going through a period that's a bit difficult at the moment but he works very hard in training and I'm desperate to keep him."